This weekend was to be an exciting one for me. 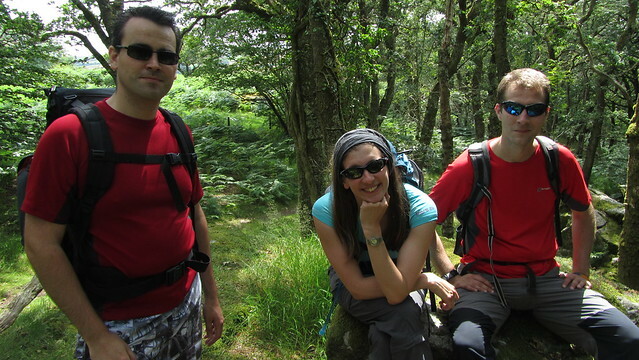 This trip was the culmination of my collating Dartmoor Tor related data from various sources, and the masterful work of +Phil Sorrell, creator of www.shareyouradventure.com, moulding it into a valuable tool for both Social Hikers and Tor Baggers! This weekend, in addition to a wild camp on Pew Tor, we were going to give this, soon to be released, addition to the site a field test! We had formulated a plan beforehand, as there were some significant considerations to take into account. 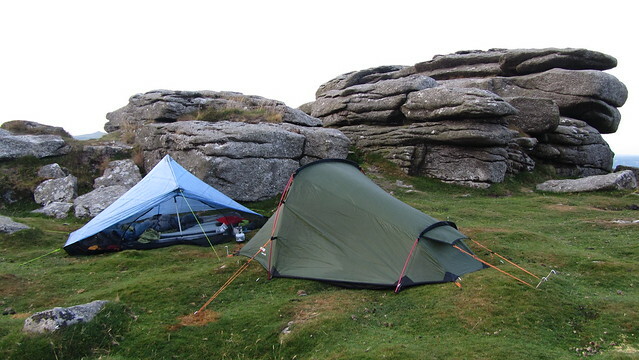 First priority was to realise an ambition of Phils', which was to wild camp on Pew Tor. 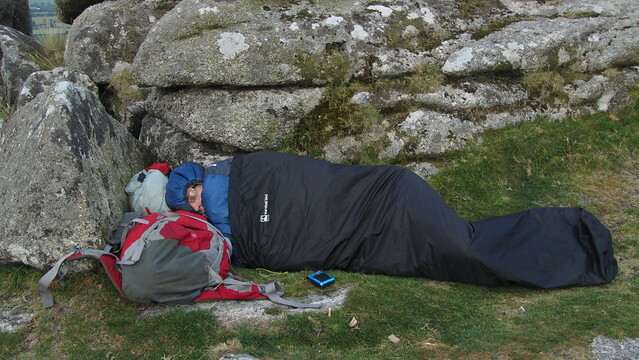 Normally, this would be done by incorporating the overnight into a two day hike, but as Phil had been suffering for months with Sciatica, and had only managed a walk of a few miles the week before, we had to be cautious. 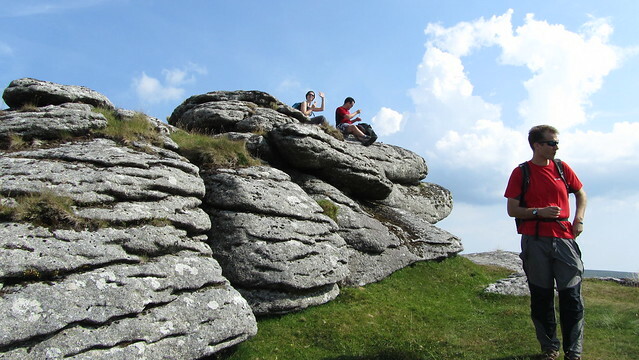 The best option would be a day walk, an evening meal at the Dartmoor Inn in Merrivale, and then head out to Pew Tor, from the pub, for the night. My task then, was to devise both a circular day route that Phil would be able to manage, but with plenty of escape routes should he have back problems, as well as feeding my hunger for more Tors! 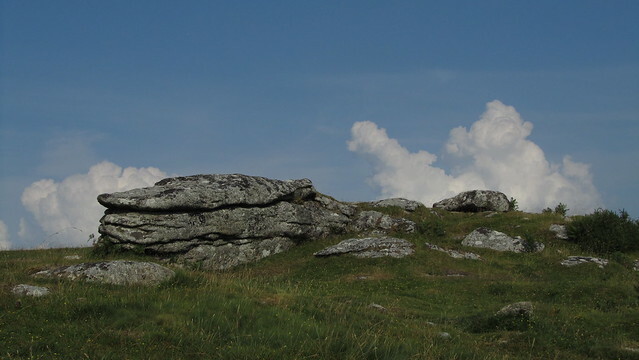 My ambitions of visiting every tor and significant rock on Dartmoor had started in earnest months ago, so it had to be a route that would help me bag some more, and this particular stroll had the potential to find nineteen, fourteen of which I had never, knowingly, visited! It was also more than enough waypoints to find to see if some of the data collated was reliable. 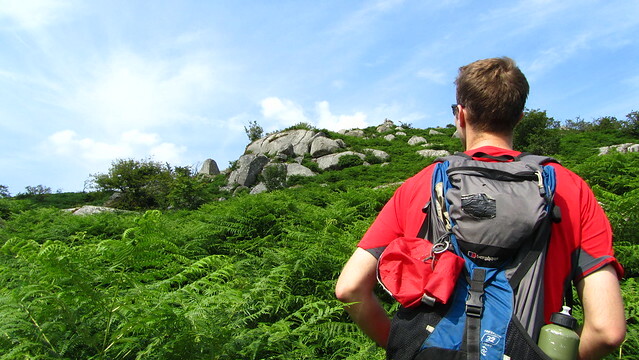 To help with this, Phil was using an impressive fancy app called "Pushover"; a notification system on his smart phone that could tell us when we had bagged a peak! 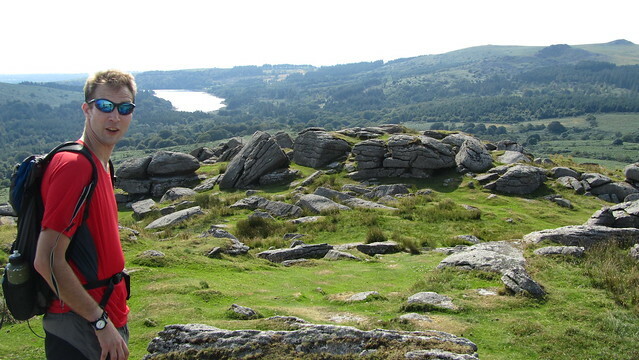 Don't ask me to explain how it all works, for all I know he was in SMS contact with Dartmoor pixies! Our party of four met up just before eleven on a hot and humid Saturday morning; Phil, Kate,Neil, and yours truly. Whilst I had arrived early and feasted on a small breakfast at the Fox Tor Cafe, traffic had delayed the others on their journey from Bristol, but this was not to be a hurried day so it mattered little. Because the route was a circular, there was no designated start/end so we had some flexibility, choosing a car park a couple of kilometres out of Princetown, on the B3212, below our first Tor of the day. As we headed off, I was probably as anxious as Phil was as to how his back would cope but any doubts began to melt away as we ascended Sharpitor through the clitter. We had Sharpitor in the bag quickly, and we were now on the intended route; only question was which way, clockwise or anti-clockwise. 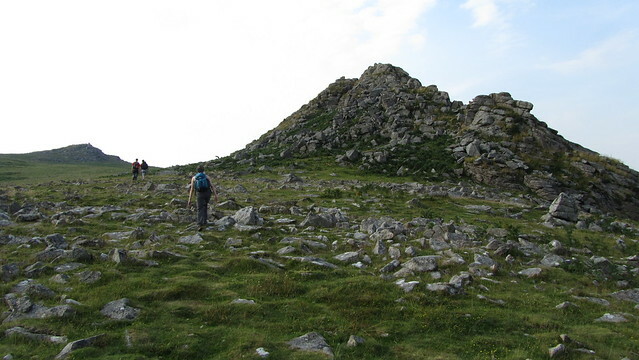 I considered descending from Lower Leather Tor to be a bigger challenge over rough ground than ascending, so decided it best to leave it until last, and we drifted anti-clockwise, down from Sharpitor to Peek Hill. 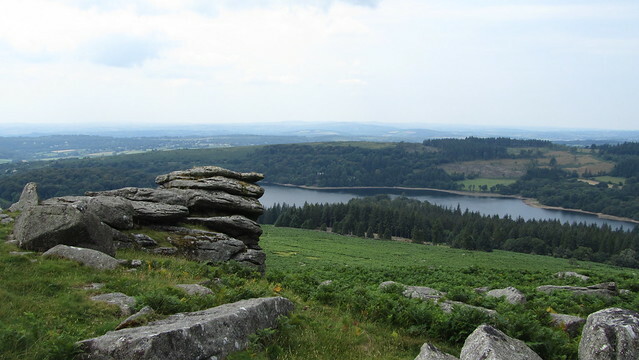 Soon, from Peek Hill, we saw the outcrop below that is Lowery Tor, and down to it I had to admire the magnificent view it had of Burrator Reservoir. Moving on, we met up with a path that took us into Peekhill Plantation, a respite from the baking sun, although not the humidity. Phil filled up from the small stream running through the woods, before we met up with the more significant Devonport Leat. We followed this watercourse as it contoured first the plantation and then Yennadon Down. 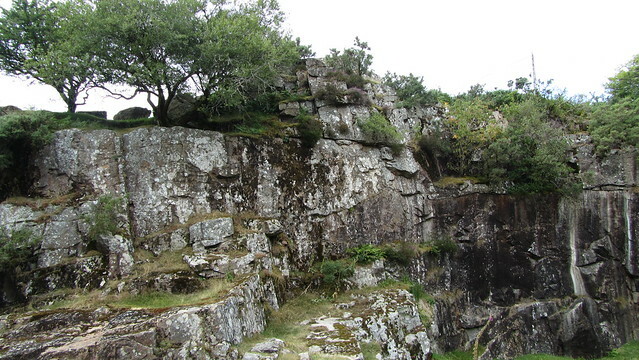 When the leat disappeared into a pipe near Yelverton Reservoir, we picked up a good track to Claig Tor. Claig Tor, at first sight, looks pretty insignificant. 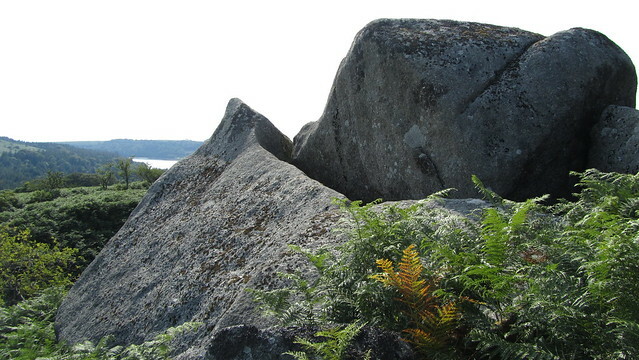 A low level outcrop partially hidden by ferns, it is not until you have hopped onto those rocks that you see the drop down to the road by Burrator Reservoir. We stopped for a break; I said we were in no hurry! The other three tucked into their black pudding and chilli pork pies, but still fortified by my breakfast, I would save mine for a little later. Taking a path down to the road beneath the tor, you get a better view of its precipitous drop. 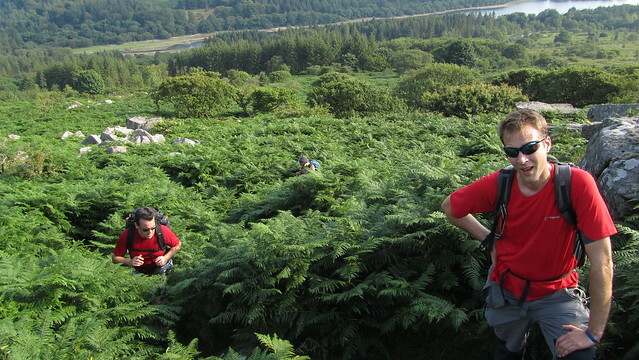 We crossed the dam and entered some woods in search of Burra Tor. Not too difficult to find seeing as it was a substantial tor, but if you hadn't known it was here, I doubt you would venture into the foliage which would be a terrible shame because it's a lovely tor. 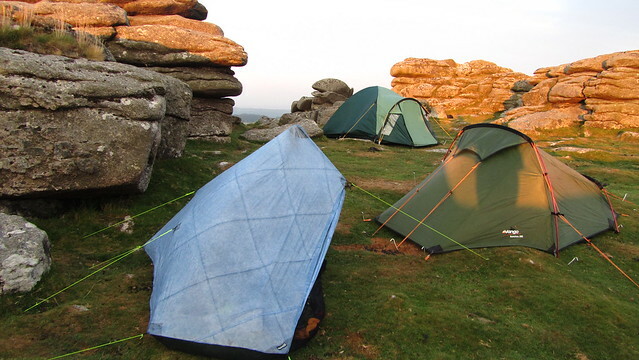 We spent some time exploring the overhangs and possible sheltered bivvy options; I do love these hidden gems. 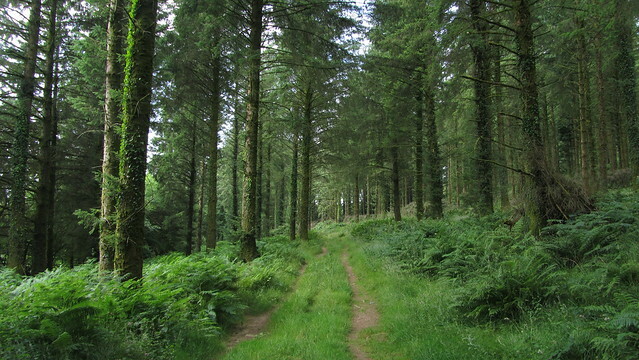 Back out of the woods and on the road, following it as far as the outskirts of the small hamlet of Sheepstor. We turned left and eventually left the road on a bridleway that brought us out onto open moor. In front of us, stood a large hill, and we were going up it. 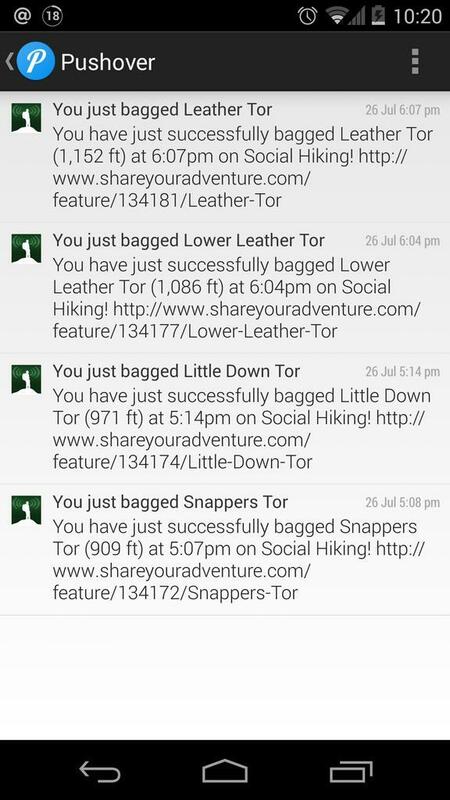 We bagged Maiden Tor almost immediately. 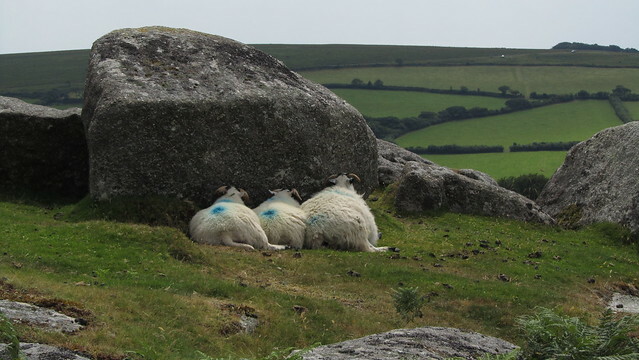 Three sheep desperately sought shelter from the seering heat, huddled against a rock that provided little shade given it was not far past midday. I know how they felt! "We've got to go up that?" 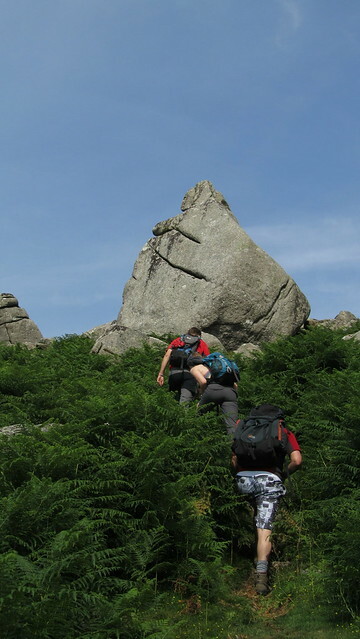 Before us, the way to Sheeps Tor summit looked steep. I saw a few people snaking right on a less strenuous path and we headed that way, but for some inexplicable reason, I fancied something a little more direct and so, as the others continued, I picked my way up the steep side. I beat them to the top, but my prize was little more than rapid heart beat and shortage of breath! Thankfully we stopped again to admire the vista. From this vantage I pointed out the rest of the route to Phil, to gauge whether he felt up to the task; no worries on that count! 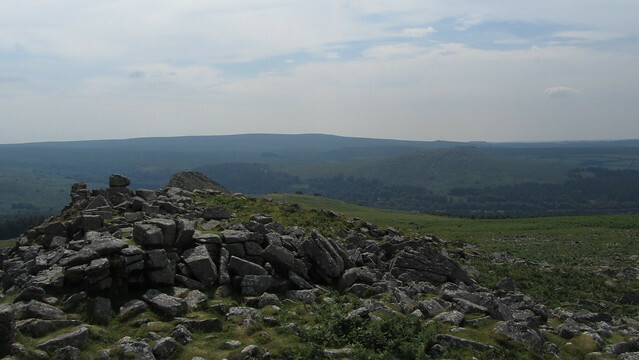 It was a short walk to Narrator, which sat north of Sheeps Tor, but on the same hill. 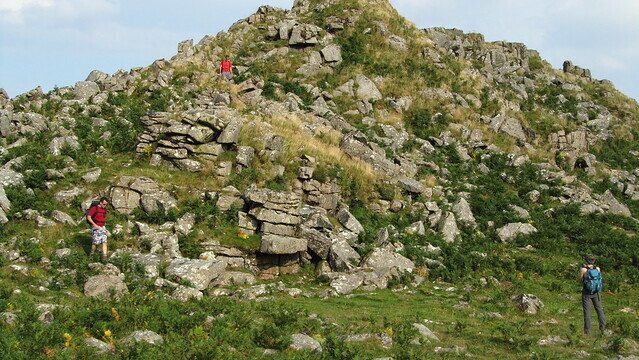 We eyed up the plantation below us and tried to figure out where our best way in would be to find Rough Tor. Down we went to a broken gate into the plantation. 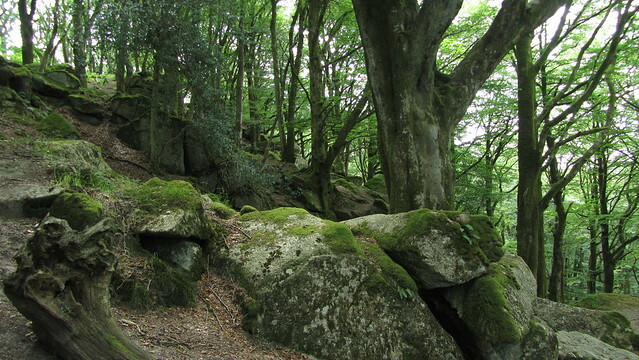 We guessed the best plan of attack would be to make our way, as best we could, to the high point of the woodland on its edge, before veering into the more dense sections to find our goal. 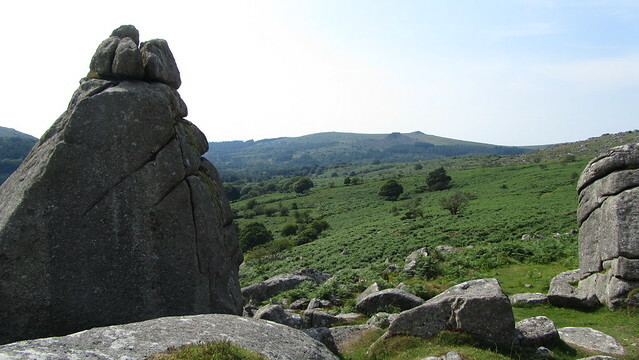 I read the description of what we were looking for in the excellent Dartmoor Tor and Rocks guide, and carefully stepped through the carpet of fallen branches. 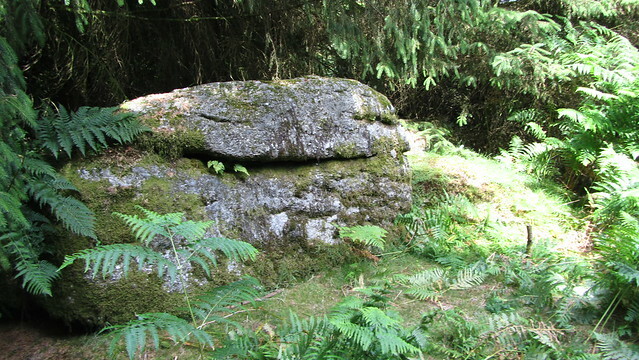 We were all pretty pleased when we found it, and it probably gave us the most satisfaction, despite it being little more than a low collection of moss covered rocks! 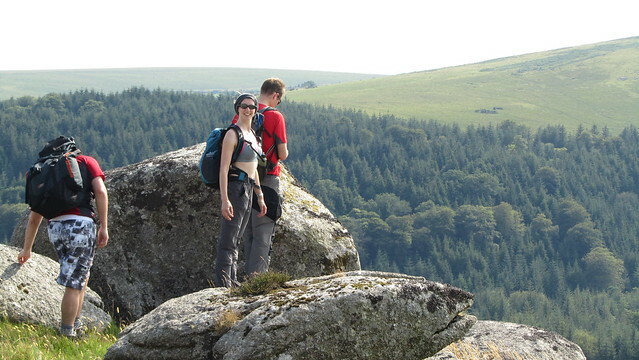 Kate happy to bag Rough Tor (Burrator)! Traipsing out of the woods, we picked up a path down to Narrator Brook to collect some water. We were all guzzling down quite a bit today and constant rehydration was vital. 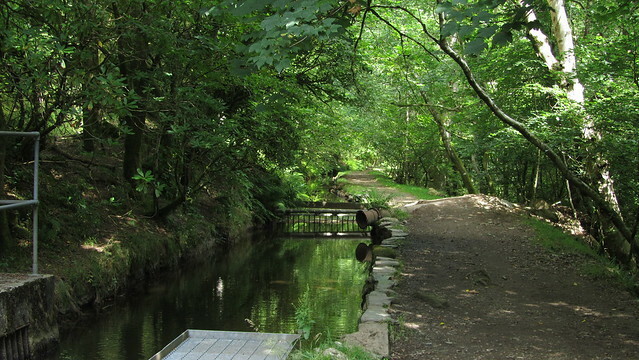 There was a small path alongside the brook, in welcome shade. 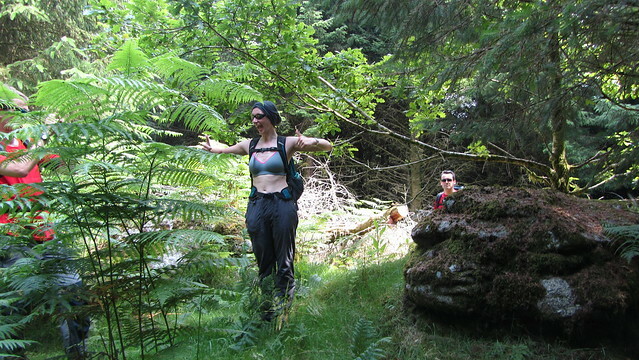 Our next waypoint was, once again, hidden amongst the trees, but up on a steep bank. Below it, there are the ruins of an old blowing house, a remnant of the tin mining in the valley. We found what looked like the ruins but had some difficulty finding a way across the fern covered valley floor, and up the side. It took some grabbing of earth and faith in its stability to reach Click Tor. 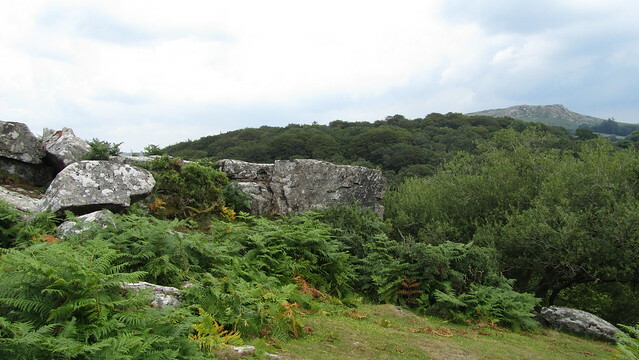 Mindful of the route up, I looked above the tor for a better option, but ferns had concealed any safe passage. It was sensible to go back the same way, but on the way up I had spotted that we had hit upon a semblance of a path, so we followed that path, taking us to the wall of the blowing house and a much easier route down to the brook. 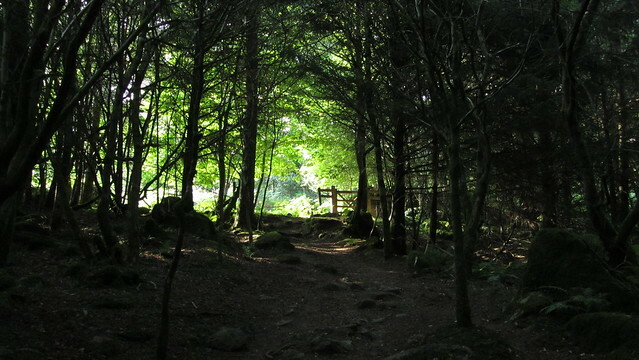 Continuing along the path, rising higher, we came out of the woods. Across the brook we could see what we believed to be Cuckoo Rock. However, the path wasn't taking us there and it was a way out of our way before we had dropped down and across the brook, and were moving back towards it. Once again, the ferns were so prolific they were causing us problems. each step along a possible path was fraught with the possibility that we might stumble into a clitter field and end up risking a sprained or worse, broken ankle. 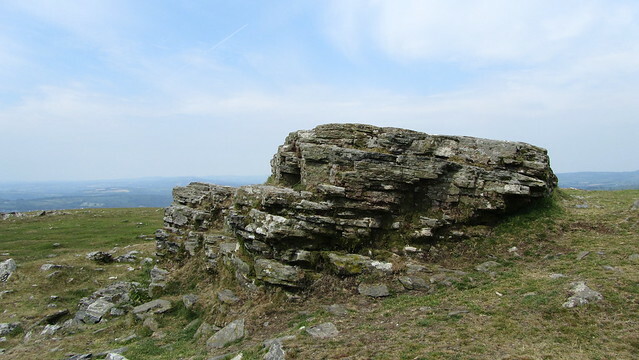 Bagging Cuckoo Rock was proving the toughest of all. The foliage had made it indistinguishable from its picture in my guidebook, but we were pretty sure this was the spot. We checked my GPS for our exact location, and it confirmed we had to ascend a little more north. 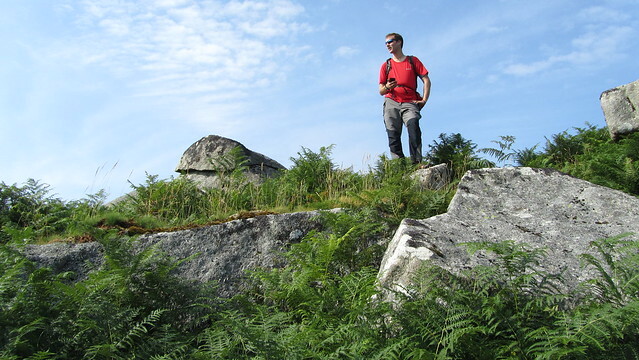 The next large rock was undoubtedly our treasure, and, through the wonders of modern technology, Phil received a notification via the Social Hiking website, to tell us we had successfully bagged it! 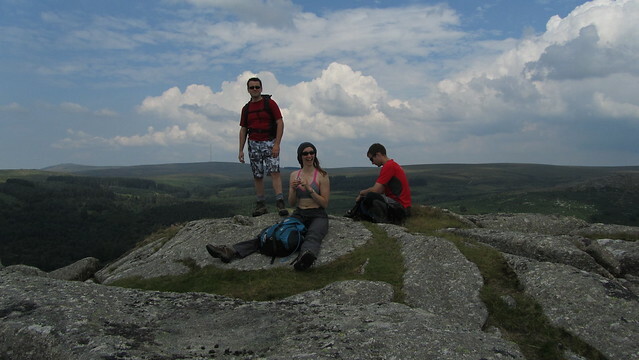 Relieved, we continued up to Combshead Tor. There was no mistaking this one; it was a proper looking tor! Guess what? We had a little sit down on top of the tor, as was now the custom, before moving on. Significantly, we had turned a corner, and were now heading back in the direction of the car. 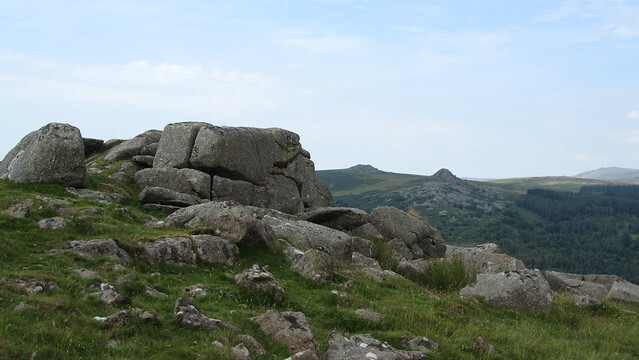 Hingston Hill could have been missed if we weren't paying attention, such was the enormity of its peak and the distraction of Down Tor on its slope below. 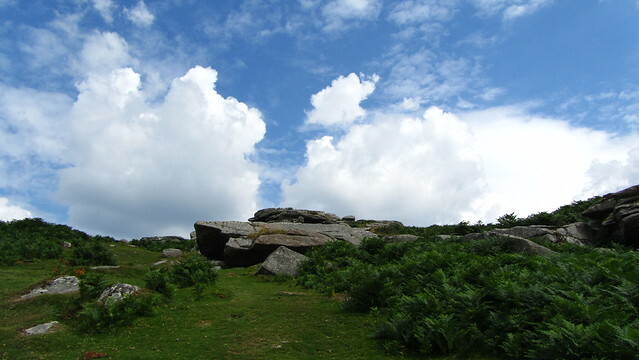 Down Tor has a couple of major sections, so be sure to visit both to ensure you bag it properly, and just below it, by a low wall, lays Little Down Tor. But first, we went looking for Snappers Tor. 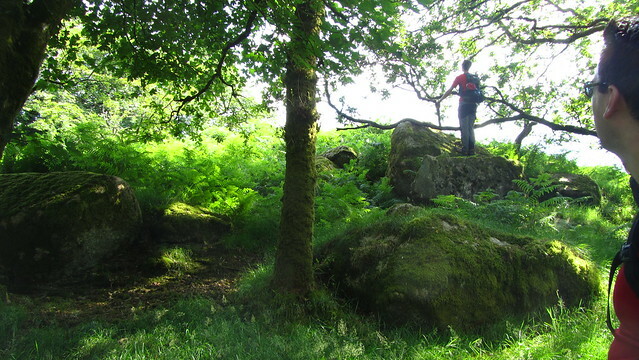 Another precarious traipse through ferns, and therefore unecognisable from the book, but we found the most significant rocks and once again, Phil received notification we had done good. Unfortunately, all was not good. We have subsequently found out, some 4 months later, that, thanks to good work by +Matthew King, we had made an error! Snappers Tor? Turns out it wasn't. Back up to Little Down Tor, we were on a decent path now, to the real Snappers Tor, which we had mistook for Middleworth! 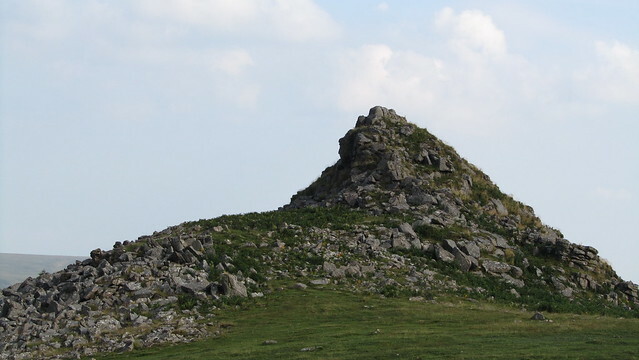 Easy mistake; even Ken Ringwood says they are often mistaken, but for us it meant we went off the hill without actually bagging Middleworth Tor! 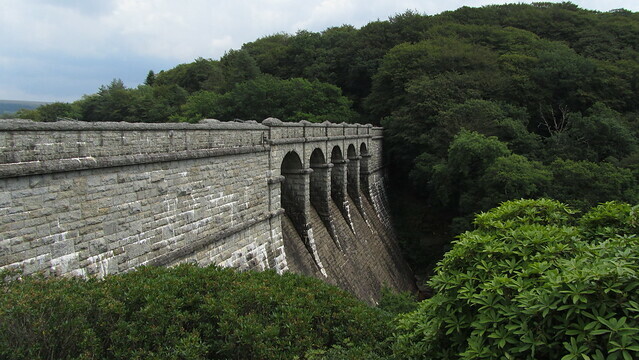 The path continues to be a good one, dropping down to the car park at the eastern end of the Burrator Reservoir, where an ice cream van wooed us into making a purchase! 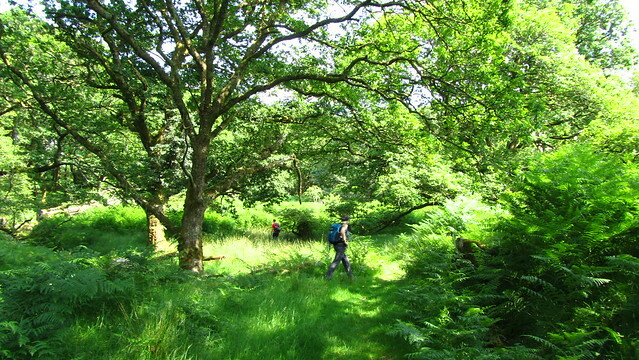 Lollies finished, we entered the dense Norsworthy Plantation, following a footpath through to the Devonport Leat, hugging the southern lower edge of the final climb of the day; up to Lower Leather and Leather Tor. 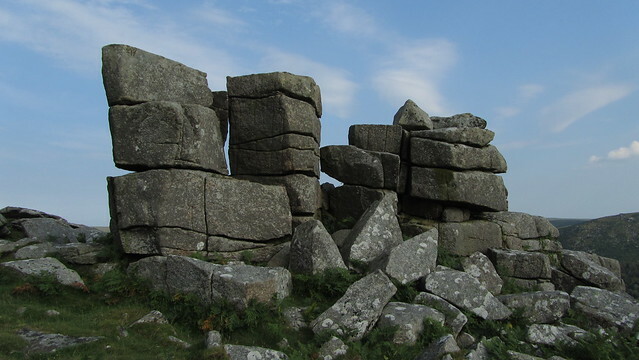 A narrow, rocky track climbed up through the ferns and clitter on its southern flank, but once at Lower Leather Tor, the way becomes easier to traverse. 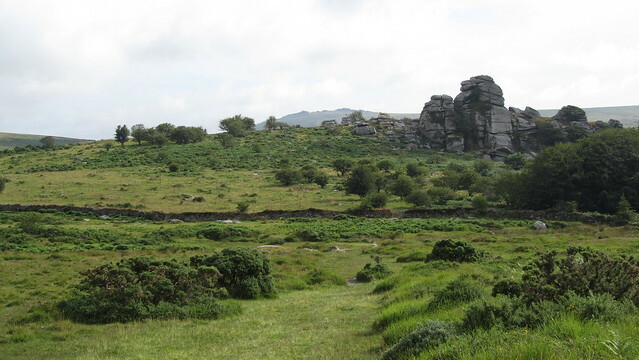 We stepped away from the tor to find the easier ground around to its northern point, where a mild bit of scrambling takes you to the top of Leather Tor, and our last goal of the day! Nineteen! Over the lower slopes of Sharpitor, we were soon back at the car. 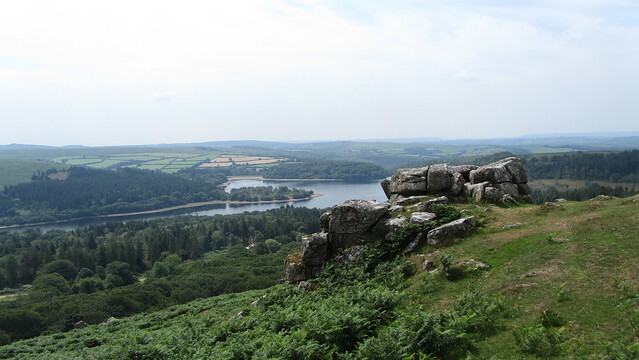 Pretty dehydrated, exhausted, we returned to Princetown where I collected my camping gear from my car, and then drove the short way to Merrivale for dinner at the Dartmoor Inn. A pint of refreshing cider, a steak dinner, and I was ready for bed, but there was the small matter of a half hour walk from the pub to Pew Tor, and as we set off, plagued by midges, both the darkness of night and a creeping mist were chasing us! 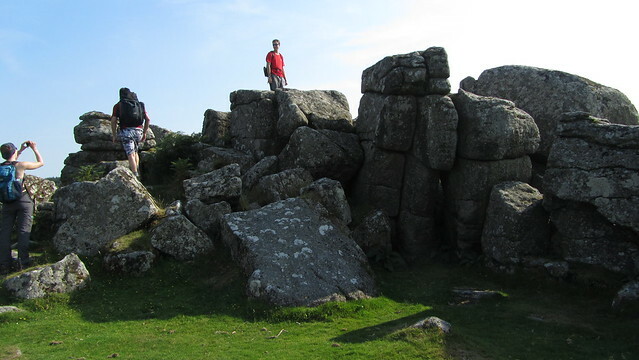 We arrived at Pew Tor about 10pm, and it was difficult to contain disappointment at the terrain. It was far from what both Phil and I had remembered, its pristine grassy lawn fit for a Wimbledon final was, in reality, a random assortment of grass mounds, laid out thinly across the granite. Still, we were here now, and we made the most of it. Amazingly, I managed to find a sweet spot in my little Z-Packs Hexamid Solo, and the night was a good one. As soon as we had all pitched, with Phil bivvying, it wasn't long before we were all in for the night. A breeze picked up and it wafted through my shelter making it a pleasant night. 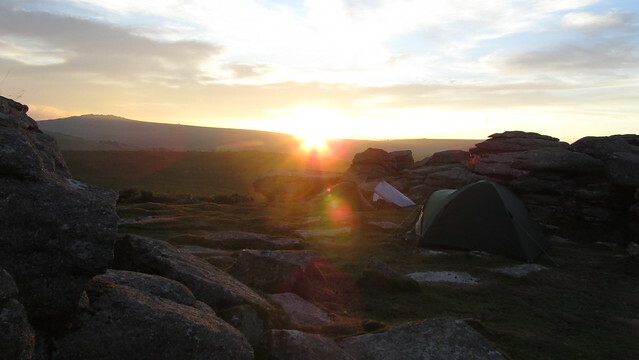 I awoke about 6am, stuck on a brew and took a wander around the tor to take some photos. I was on my third cup of coffee by the time the rest began to stir, but today was pretty much like the last, no hurry and nothing too strenuous. 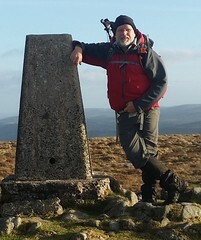 Phil proclamed that his back had survived, despite the odd worrying twinge, and so we packed up, headed back to Princetown for a proper breakfast, and then sought out another final tor to bag. 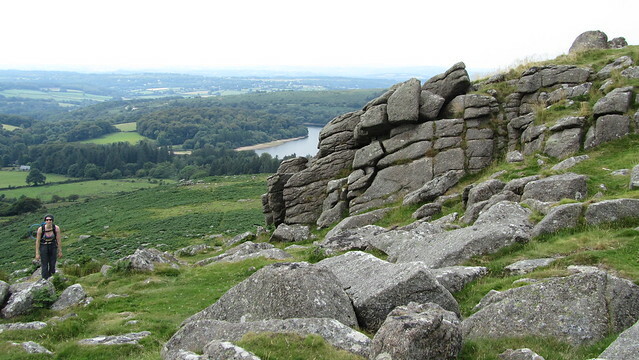 We parked at Postbridge, and walked up to Bellever Tor. 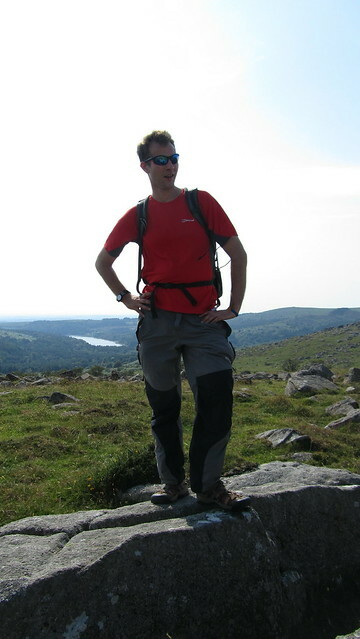 I could tell that Phil had caught the tor bagging bug and his fitness was improving because he was eyeing up Laughter Tor in the distance and forming a route in his mind. But Kate reigned him in with a reminder that it was time to start the journey home, and so we retraced our footsteps. So back at the car park, we said our goodbyes. A great weekend, top company and one we must do again soon! As for the field test. It all went rather well. A couple of issues with actual location of a couple of the tors, but they were minor. 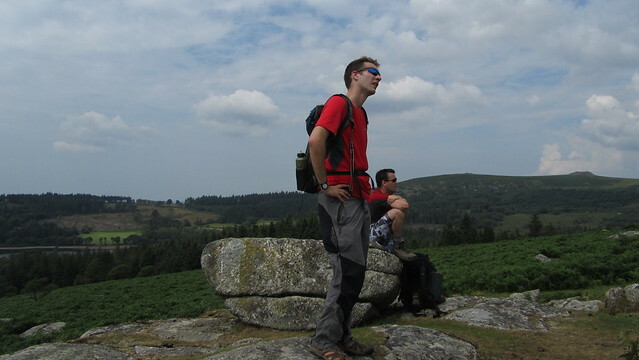 There is still some fine tuning at the Social Hiking end before the Tor Bagging List is released, but I am really excited about it. When it goes live, I suspect it will generate a great deal of interest in this little patch of moorland in the South-West.